Now let’s go into Part 2. Look at your audience. Imagine how you would feel if your audience had their behind to you for most of your presentation. With that in mind, don’t read from the screen with your back to the audience. If you need to read one or two of your slides, stand to the side of the screen. Remember your audience came to see you, not your slides. Face your audience to connect with them. Be so well prepared that should the technological equipment fail to function, you can go on without the slides. I spoke at a women’s retreat where the power did go off on the second day. With my preparation of an outline and brief notes, I continued without the projector. When you speak, don’t block the screen. You don’t want the glare on your face. It does nothing to improve your looks. It ages you. When you don’t need your slides, turn the projector off with a media remote control if one is available. If one isn’t, turn it off yourself or have someone do it for you. Before your presentation, ask if the other person knows how to turn off the projector. If he/she does, that’s great. If not, give the person the opportunity to practice ahead of time. At the end of a presentation I attended, eight women stood in front of the projector to have their picture taken. No one had turned off the projector. They had the glare on their faces for all the pictures. Avoid the temptation to place your index finger on the screen to point to text on the slides. Newer models of media remote controls will have a pointer on them. Use the electronic pointer. If yours doesn’t have one, present the content without pointing. An author made a DVD of her presentation. Although she had excellent content, she pointed on the screen with her index finger throughout the presentation. I found it distracting. Her audience may have too. Furthermore, she blocked the view of the audience every time she pointed with her index finger. When the DVD showed the men and women in the audience, I could see them leaning to the right or to the left to see the screen. Many people suffer from allergies or asthma. As presenters, we want to do what we can to eliminate toxins that trigger allergies or asthma in our attendees. Everyone in our audience deserves a healthy, safe environment. Prior to my awareness and purchase of the Expo low odor dry erase markers, I wouldn’t use dry erase markers. I didn’t want to be responsible for someone in my audience going to the emergency room because of an allergy or asthma attack. When you speak on a heavy topic or give a lengthy presentation, break up the tension with humor. Please don’t insert a string of jokes that have nothing to do with your topic. You can use an example from your own life or something that happens during your speaking engagement. For example, during an hour and a half presentation, I tripped over the cord on the microphone. I laughed at myself and said, “My name is not Grace.” The audience laughed with me. We laughed harder when I tripped over the cord a second time. You may find a cartoon online or a sign in your everyday life that enhances your presentation. Have your cell phone ready to take pictures. If your topic is self-editing, you’ll find countless billboards that will provide humor for your presentation. Stay away from the projector’s glare. Avoid chemicals, perfumes and other strong odors. Follow those guidelines along with the ones in Part 1 for a successful PowerPoint session. 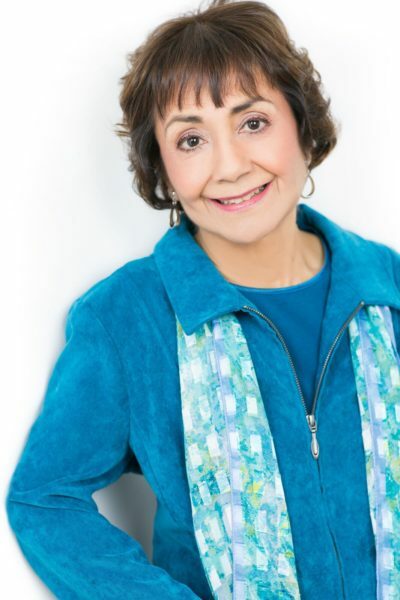 Yvonne Ortega speaks with honesty and humor as she shares her life and struggles through presentations that help women find comfort, peace, and purpose. Her background as a licensed professional counselor gives her a unique perspective into the heart of women. Her counseling experiences in jails, prisons, and outpatient services add depth and humor to her presentations, as do her years of teaching mostly high school and college Spanish. Her presentations are interactive and down-to- earth with application for the audience from God’s Word and his promises. Yvonne is also a speaking and writing coach and the owner of Moving from Broken to Beautiful®, LLC. She is the author of four books: Finding Hope for Your Journey through Breast Cancer, Moving from Broken to Beautiful: 9 Life Lessons to Help You Move Forward, Moving from Broken to Beautiful® through Forgiveness, and Moving from Broken to Beautiful® through Grief. 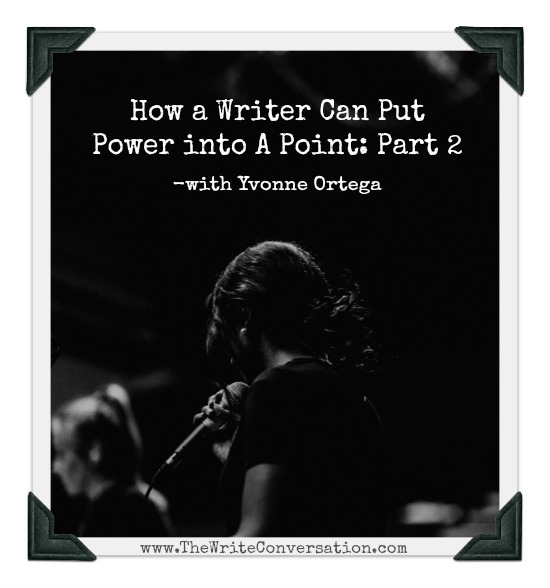 Yvonne is a member of the Advanced Writers and Speakers Association (AWSA), the Christian Authors Network (CAN), the National Speakers Association (NSA), and Toastmasters International. Thank you, Anna Hadley and Cathy Fyock. It’s your book’s birthday: time to celebrate! Are You Ready for New? Has God Breathed Life Into Your Writing? Have You Entered the WRITING ZONE? Am I Content to Follow God—No Matter What? Have a Very Happy New Years!